The Irish Football Association (IFA) has condemned a video of people - some wearing NI football shirts - singing a sectarian song. The 20-second video, circulating on social media, shows people singing "we hate Catholics" to the chorus of Tiffany's "I Think We're Alone Now". It is believed to have been taken in a bar in Belfast on Sunday. A County Tyrone football club has apologised "to the Catholic community for the obvious offence caused". BBC News NI has blurred the faces of individuals who are not believed to have been singing. Killen Rangers released a statement on its Facebook page in response to the video. It said that members of the club were in Belfast for the Northern Ireland match and that it wished to "condemn" the chanting "without hesitation". "Those who know us or who have had any dealings with our club will be aware that we have been doing everything in our power for the best part of a decade now to make our club more attractive to all sides of the local community. "This work is ongoing and we have no intention to withdraw from this pathway due to a minority of individuals who really should have known better." The club added that it will address the matter in line with club policy and that if "disciplinary action is deemed appropriate then the necessary sanctions will be taken without hesitation". The IFA said it will work to ensure those involved are stopped from getting tickets for NI matches. 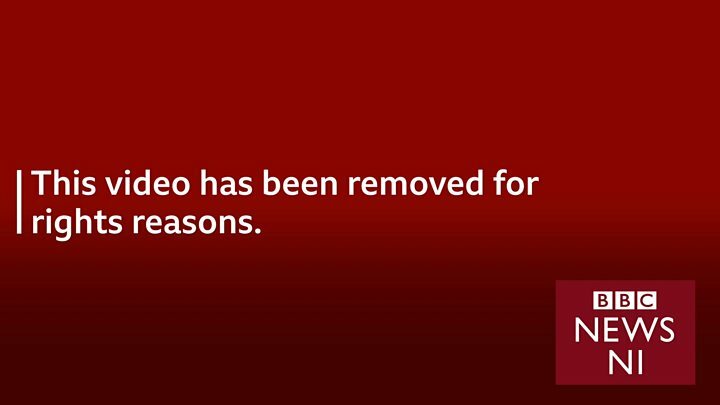 Media captionThis video has been removed for rights reasons. "The Irish FA condemns sectarianism of any kind," it said. A TV screen in the bar appears to be showing the Scotland-San Marino match, which was played on Sunday evening. In an initial Twitter response, the IFA said: "This is utterly wrong and we condemn sectarianism in any form." Some of those singing the sectarian lyrics are wearing Northern Ireland shirts. Alliance leader Naomi Long said the singers should be identified and "banned from future games". As of Tuesday morning, almost 230,000 people had viewed the video. The PSNI spokesperson said they are aware of the video.